Posted on 1 July 2012 and filed under Miscellaneous. It is hot these days. As it is supposed to be in July:) Do you practice siesta during which you do not do a thing, or are you thinking how to employ your fingers while sitting in a shade? 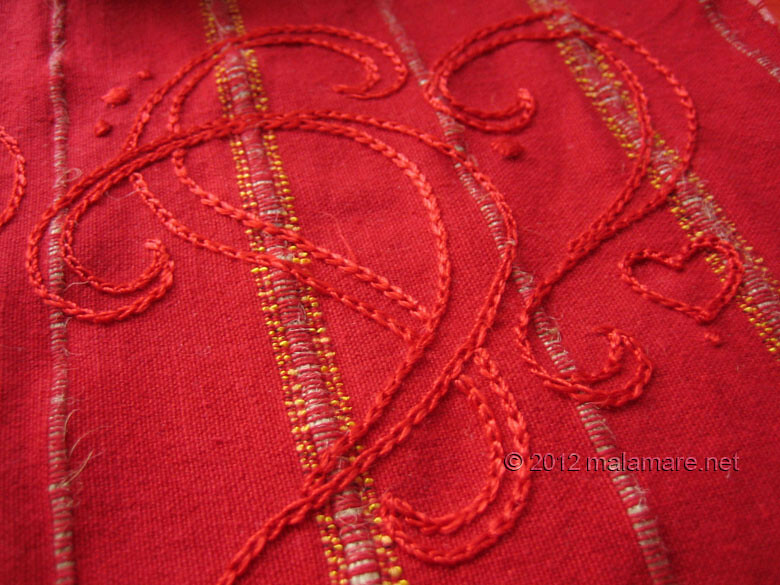 If threads and needles are at hand, I have got a suggestion – let’s do next hand embroidery stitch: chain stitch! Bring the needle and the thread to the front of the fabric. It helps to hold the thread down with your left thumb towards the left at this point. Insert the needle into the fabric almost at the same point where the thread came out and bring it up to the front of the fabric at a distance that will be a length of a single stitch. Form a loose loop and make sure it is below the tip of the needle. Pull the needle and the thread through. 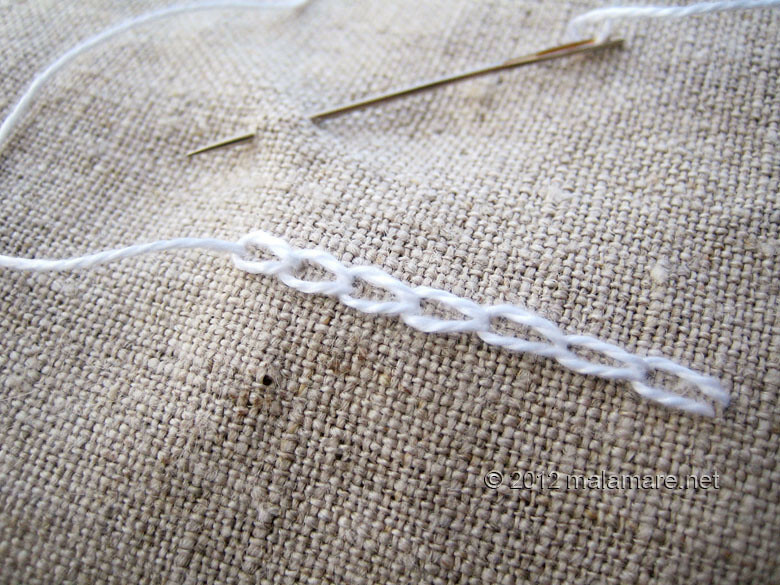 Pulling the thread some more, gently tighten the loop – and here you have the first loop of your chain stitch! For second and consecutive stitches continue as for the first stitch: insert the needle next to the point where the thread came out of the fabric, keep it towards the left with your thumb, form a loose loop, bring the needle up through the loop, pull through and gently tighten the loop. Repeat continuing along the line you are embroidering. And here is your chain stitch! 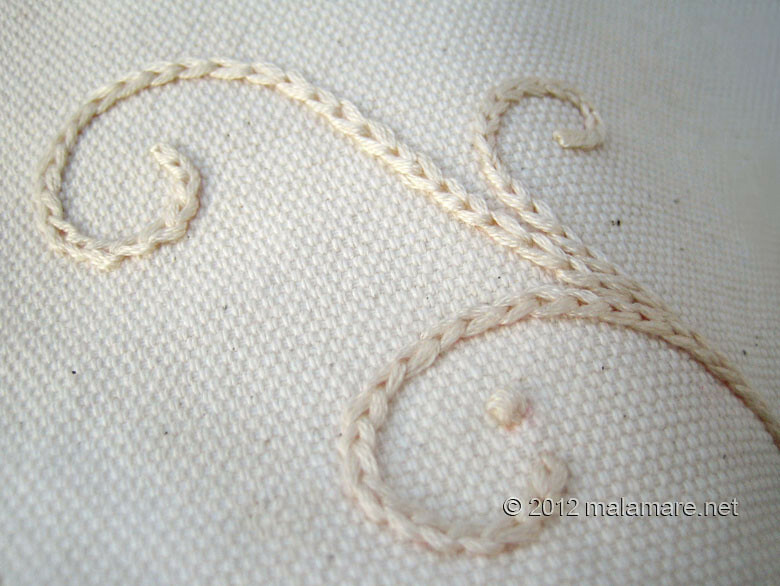 I find the chain stitch beautiful for soft flowing lines, and here are some examples of what I do with it. 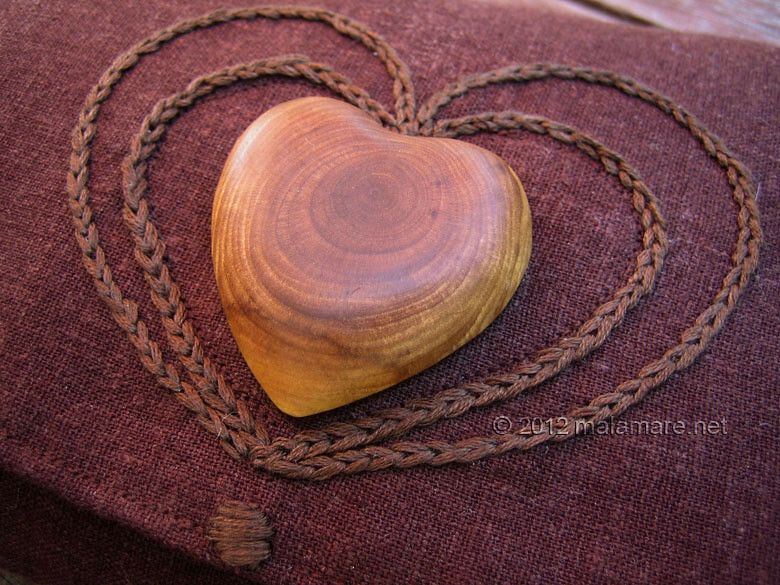 Swirls on a Love bag. Chocolate hearts on another Love bag. Hearts, hearts, hearts, here in silk thread on cotton fabric.